What makes a food picture Spring full? Sure the light should be natural and maybe with some shadows, there should be greens involved in the food; pink colour makes me think about flowers and good energy… The food itself should be refreshing and light… this is what I thought to get my picture and post sent to Click! Guess what the subject of the month is: Spring. Visit Jugalbandi and participate in their event or simply enjoy good photography and recipes. You don’t need to cook to get it done!!! Just throw the ingredients in, blend, place in the fridge and let your guests love you more than ever ;D. This has been such a long and cold Winter that I’m longing for fresh and new dishes like this one. Handy, healthy and cheap ingredients! Since I used Danone yogurts for the recipe, I thought you might be interested in this: Danone opens the first Shop and Restaurant in Barcelona City with Yogurt as main Star! From now on you can enjoy a healthy breakfast, snack or meal from a menu of 26 dishes. The space, named Barcelona Danone, is a multi-shop and restaurant of 300 square meters which is the largest showcase in the Catalan capital. A pioneer space that offers consumers the chance to taste yogurt in so many different formats, also shows the latest news from the brand and the menus are based on a healthy Mediterranean diet. A fantastic experience! If you want to know more about it, please follow this link to La Vanguardia. Or if you want to see the promotional video, just click here. 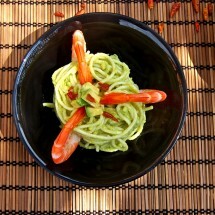 Want to see other recipes with Spring breeze? What about these? Chocolaty or lemony Muffins… a delicious breakfast! Love potion number 10… Spring is the time to be in love! Figs and Ham… Soon, really soon we will have the first figs of the season, yum yum! 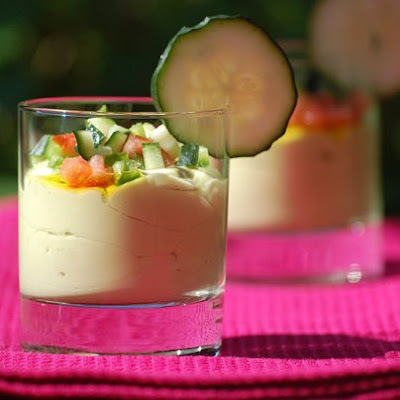 It serves 4: 3 avocados, 4 natural non sugar yogurts (125 grs each), 1/2 a cucumber, 1/2 a green pepper, 1 tomatoe for a salad, 2 table spoons of extra virgin olive oil, 2 table spoons of white vinegar, 1/2 a garlic clove, salt and black ground pepper. Take the avocado pulp and discard the skin and seed. Place the pulp in a bowl, add a teaspoon of salt, the yogurts, the garlic, the oil and the vinegar. Blend until you get an homogeneous texture. Place in the fridge to cool down. Wash the cucumber under tap water. Dry and cut 4 thin slices. Cut the rest in small dices leaving the seeds away and reserve. Wash the tomatoe under tap water, cut in half and discard the heart and seeds. Cut the rest in small dices and reserve. Wash the green pepper under tap water, cut and discard the seeds and whites. Cut the rest in dices and reserve. Place all veggies in a bowl and sprinkle some salt and black ground pepper. 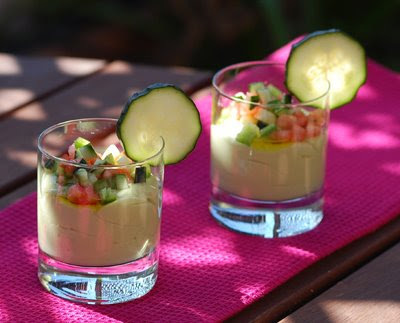 When the Avocado gazpacho is cold, pour in 4 glasses, decorate with the slice and dices and enjoy it! Maybe you can add a bit more of extra virgin olive oil or a bit of water to get a finer texture and not so creamy... but we loved it this way :D.
Don't let the gazpacho stay in the fridge for more than 3 hours, it could turn brown (avocado oxidizes). What a refreshing spring presentation. And when you’re done with the gazpacho, could I have the cucumbers for my puffy eyes? Nuria, I agree! 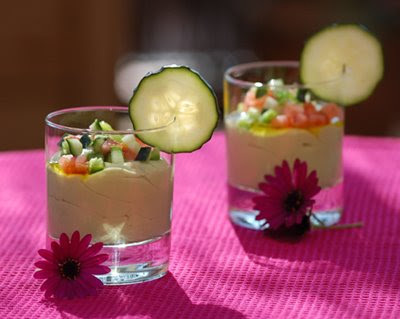 You really have captured the essence of spring with this lovely recipe and pics! Thanks Peter! You are a Caballero :D.
Thanks Jenn! I should go over your blog to see what’s cooking!!! I have been absent for a while. 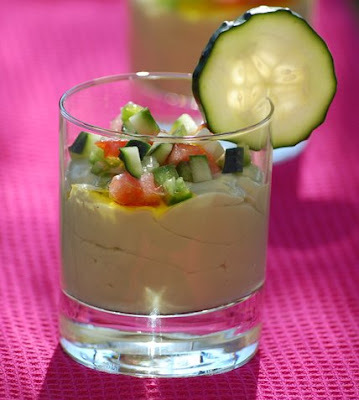 i love this recipe and will be making it as soon as i get an avocado (probably tomorrow). and i simply adore the second pic with the light shining through the cucumber. 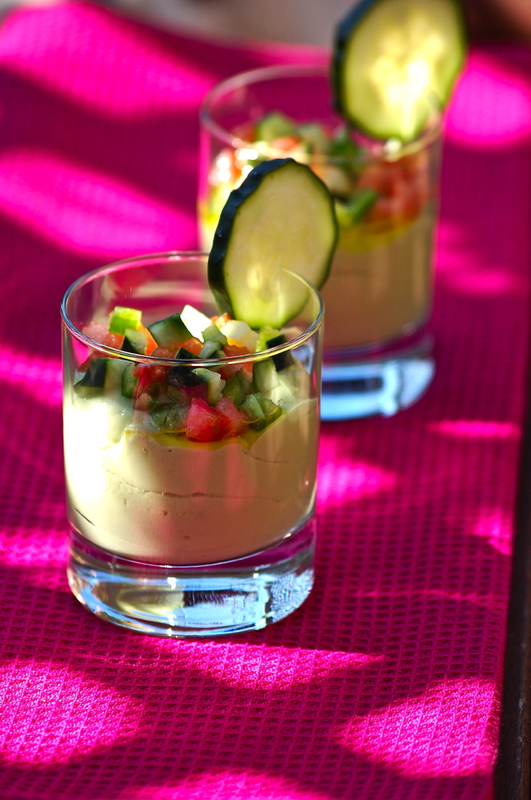 Ahh, gazpacho estrangos…out of the ordinary! Spring is here and the food, the moods of people are also blossoming..finally! 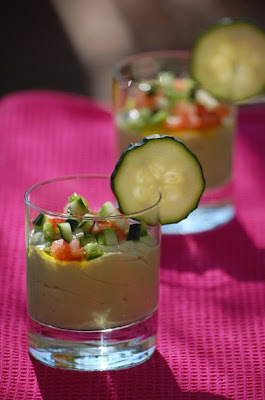 Hola Mikky and welcome to this blog :D. So glad you enjoyed the city… hope that you enjoy my recipes too ;D. If you have any suggestions on anything you tried and want that recipe… don’t be shy and ask! Siiiiii querido Pedro!!! Today is Sant Jordi! My favourite day of the year… Roses, Books, a good meal with my hubbie… and the sun is shining. What else could I ask for? All I can say is I love you Nuria! LOL You have made my day, my month and my year with this recipe. Que delicia! Un bon entrant per celebrar la nostra diada nacional, ST JORDI!!! 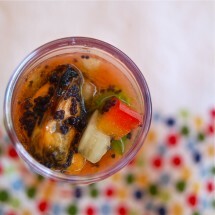 I love gazpacho and I like the way you blended it up like ice cream! looks luscious and refreshing. your pics are so bright and fun, nuria. Hey I love to be loved Ben ;D. Will you believe me if I tell you that I thought about you when I made it? I knew you would love it since you adore avocados! So I’m really happy you enjoy it :D. Un besazo guapo! Dolça, St. Jordi és el millor dia de l’any i ahir va ser una delícia!!!! Quin dia! Gràcies pel comment guapa! Si Joan, this one looks more like a cream than a gazpacho, but it was so good ;D. Have a great weekend darling! MMMMMM….Núria! looks fabulous!! Yum! Beautiful pictures again! Great representation of Spring. I love creamy dishes and that looks right up my alley! The avocado flavor must be amazing. What a beautiful, healthy , and light soup. Núria, em tens alucinada. De debó tens una sensibiltat tan bona per retratar aquestes receptes meravelloses. Un petó ben fort. Adorable photos, very Springy indeed, good luck in the contest. The gazpacho sounds like a perfect starter for Sunday brunch. Looks creamy and delicious Nuria! Yogurt is my favourite dairy product, and a restaurant dedicated to it sounds right up my alley. Cuina vermella… em sembla que som veïnes!!!! What an attractive presentation this is, Nuria. I love the way the suns is peeking through. you know, i usually am not a fan of gazpacho, but this looks so interesting, i just might have to try it!